...future generations may use the information encoded on a three inch disk, known as a Rosetta disk, to bring long-dead languages back to life. At least that's the idea. 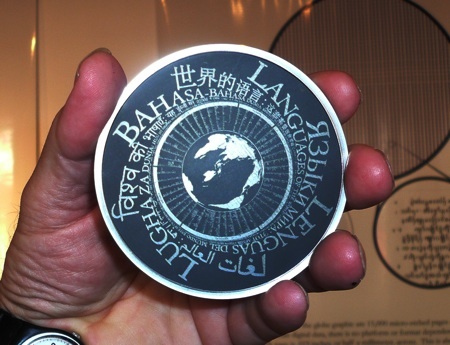 The Rosetta disk project was hatched by people at the Long Now Foundation, who used technology developed at Los Alomos National labs to miniaturize 13,500 pages of text from over 1,500 human languages onto a three inch disk of nickel. 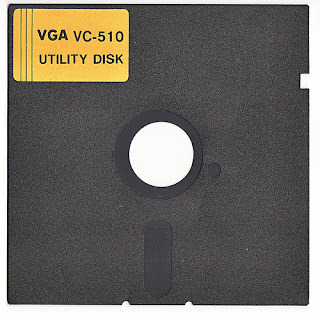 I like to think about these disks as language time capsules. 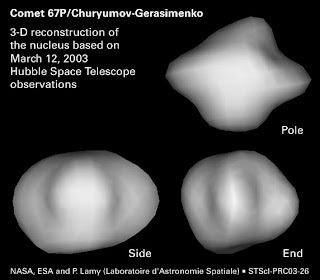 The teaser-side of a Rosetta disk. via the Long Now Foundation. Shown above is the "teaser-side" of a Rosetta disk, which reads "Languages of the World: This is an archive of over 1,500 human languages assembled in the year 02008 C.E. Magnify 1,000 times to find over 13,000 pages of language documentation" in eight languages. This graphical teaser is necessary because the tiny writing on the opposite face is so small that it is nearly invisible to the naked eye! The library of Alexandria, the largest collection of human knowledge of its time, burned to the ground around 48 BC. This was a HUGE bummer. If only the librarians had made duplicates!! With that in mind, the Long Now Foundation people have created multiple Rosetta disks. It is more likely that humanity's linguistic past will be preserved with multiple disks scattered across the globe, in the event that one country decides to go on a disk-smashing-binge. 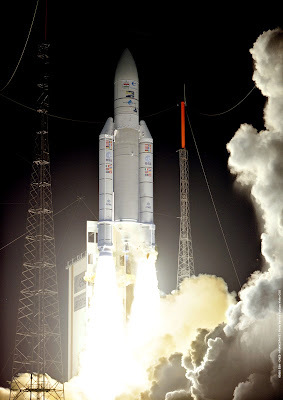 In an abundance of caution, or perhaps because it is totally awesome, they have even sent a Rosetta disk into space!!! In February 2004 the European Space Agency (ESA) launched the aptly named Rosetta spacecraft, with a Rosetta disk on board. Wicked!! However, the spacecraft's primary mission is not to carry this nickel disk into space, but instead to go visit a comet named 67P/Churyumov-Gerasimenko. Scheduled to arrive in May 2014, the Rosetta spacecraft will not only make the first long-term observations of a comet, but it will even send down a lander to get humanity's first up-close-and-personal glimpse! As you can see from the image below, we have a lot to learn!!! But what about the disk? Why not just upload a file with the Rosetta disk information onto the spacecraft's computer? Before I answer that question, ask yourself how long you expect the hard-drive on your current computer to last. A few more years if you're lucky. Not long! Digital stuff breaks and its information is almost inevitably corrupted. Perhaps more troubling is the fact that digital formats change, making information stored in a previous format unreadable. 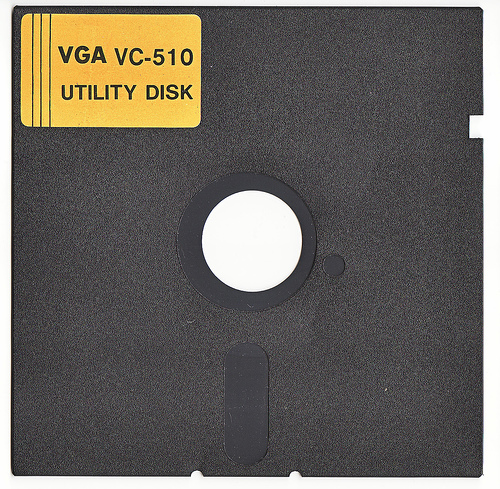 How long do you think it would take you to access the information on this 5.25" floppy disk? Pretty long, and they've only been obsolete since the 1990s! So, the idea is that information physically written out has the best chance of surviving the test of time. Miniaturization was necessary due to the incredible amount of information the Long Now people wanted to preserve. Unfortunately the information written on the Rosetta disk also has an expiration date. It is only expected to last around 2,000-10,000 years, according to the Long Now people. As the nickel atoms obey the 2nd law of thermodynamics and ever-so-slowly shift around in random directions on the disk surface, the letters they comprise will lose their shape. Bummer!! The disk will get to tour the solar system 300-1,500 times along the comet's 6.6 year orbit of the sun before becoming unreadable. Regardless of its legibility, the Rosetta disk, that relic of our curiosity, our sense of posterity, and our very existence, will probably be flying through space for a very, very long time. A likely scenario for its demise would begin with the comet making a close encounter with a planet or other huge object. This could knock the comet off its orbit and send it careening into the sun where it and its Rosetta buddies will be turned into a plasma. That kind of thing happens all the time, and was even recently captured on video (source)!!! 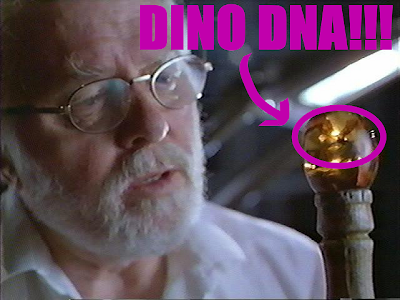 I'm going to be a downer here at the end and point out that the odds of human or non-human people finding this disk on the orbiting comet are astronomically small. But it is still awesome!! Also, I first learned that this space mission carries a Rosetta disk on the Long Now Foundation's podcast, which you should DEFINITELY check out.